Have you ever had a scholar who specializes in your field of interest completely discredit your grasp of the field entirely? I haven’t, most people haven’t, but Jonathan McLatchie has. Here’s the scholar’s credentials as of 2014. Five pages worth of academic qualifications spanning multiple disciplines including Judaeo-Christian theology, history and Biblical languages. After having explained who he was and stating his credentials, none of which Jonathan can match, I was shocked to see that Jonathan still couldn’t figure out why a scholar with more academic credentials and study would consider Jonathan to be unqualified. Perhaps Jonathan can let us know what his theological qualifications are, how many Biblical languages he knows and how many classes at University he’s taught on Islam and Judaeo-Christianity. Scholarship, Jonathan, has deemed you totally unqualified…and it isn’t the first time either. It’s that time of the day again! Steven and Vladmir are friends of Sam Shamoun and Jonathan McLatchie. Most people would remember Vladmir from the several hour videos that him and Jonathan have made for YouTube. In the below discussion, Steven Tilley, a Christian missionary, posts a photo from a book claiming that this shows the Qur’an has been “tampered with”. Changes in the way vowels have been represented is not tampering, but the development of the written text to make it easier to read, in this case, known as orthography. A common example is of “sonne” and “son” (others include “mi” and “my”, “saule” and “soul”, “gode” and “good)”, the way the written language represents the word has changed, but it carries the same pronunciation and the same meaning. Nothing more, nothing less. So, I point this out to Steven. He immediately replies that I’m wrong. Then his friend and colleague, Vladmir comes along to say that I’ll be ripped to shreds by Steven on this topic. I didn’t recognize the book at first, so I asked him what the name of it was. After a minute of posting that question, I remembered the name and found the book that the photo was taken of. Steven never bothered to let us know the name of the book, and it is most likely he’d never do that for a very good reason. That reason? The very photo he posted was taken from the chapter on….you guessed it…..orthography! After being caught lying, and having quoted a paragraph from the book by Keith Small, literally mentioning the word, “orthographic”, he decides to delete the entire post and pretend like it never happened. Fortunately for Steven and Vladmir, I enjoy conversations like these and knowing that they are influenced by the characters of Sam Shamoun and Jonathan McLatchie, they’d never correct themselves. This once again shows that these missionaries know very little about the topics they “discuss” and it is more about pride than it is about knowing the truth. The claim of this missionary is quite strange. Apparently, he believes that the name of the Godhead, “YHWH”, is insufficient to gain access to the Persons in the Godhead. You can’t use God’s name to gain access to God. Brilliant. Unashamedly, this missionary considers people like Jonathan McLatchie and Sam Shamoun to be his heroes. That’s surely no surprise for anyone here. Indeed, I am Allah. There is no deity except Me, so worship Me and establish prayer for My remembrance. –20:14. It truly is amazing just how fast bad arguments can spread. Even when the missionary you allegedly learn from recants his position, missionaries still insist on using those bad arguments. It’s quite embarrassing to say the least. Earlier today I watched a dialogue between Jonathan and someone named Inamullah on the topic of, “Is Jesus God?”. I found a statement of Jonathan’s to be quite peculiar and made a post about it. If you’re unfamiliar with Jonathan, he’s the guy that referred to immigrants in Europe as “cancers” and “viruses”. Also the guy that believes Br. Khalid Yasin, is a Caucasian man, despite being…..African American. So what was the problem? There’s an alternation between the speakers, as can be seen above. What should also be noticed is that there are Opening Statements and then Rebuttals. This is common sense, but Jonathan does not seem to understand this. In the Opening Statements, each speaker open’s….with….their…..statements! Shocking, I know! This is where each speaker presents their arguments, their research, their ideas. Following this, the speakers then rebut, that is, respond to the arguments and claims made in each others’ Opening Statements. That’s not difficult to understand, it’s pretty much common sense. Jonathan however, does not seem to understand this basic concept. In his dialogue with Inamullah, following Inamullah’s Opening Statements, Jonathan during his 1st Rebuttal asks Inamullah why he (Inamullah) did not rebut Jonathan during his (Inamullah’s) Opening Statement. You’d notice that Jonathan immediately falls into his Christian character and must find a need to insult me. I don’t mind this behaviour, after all, Jonathan did mention that Muslims were like cancer, so his hate is understandable. Follow what he says carefully though. While he acknowledges that his opponent’s rebuttal should have come during his rebuttal period, he still and amazingly so….argues that his opponent must also rebut him during their Opening Statement. I agree with Jonathan, your opponent does have a responsibility to engage with your material, that’s why there’s a Rebuttal period! There’s a solution for that Jonathan, it’s built into the format of the debate, it’s called Rebuttal periods. The problem here is quite a good example of Jonathan’s inability to deal with criticism. There was no need for him to be condescending and rude during the debate, by speaking down to his opponent directly after his Opening Statement. You don’t demand things of people during a debate, you most certainly don’t order them around if you don’t like what they’re saying. If only there wasn’t a moderator, how much more uncouth would he have been? There are what? 250 000 manuscripts of the Qur’an worldwide. What does the missionary read? 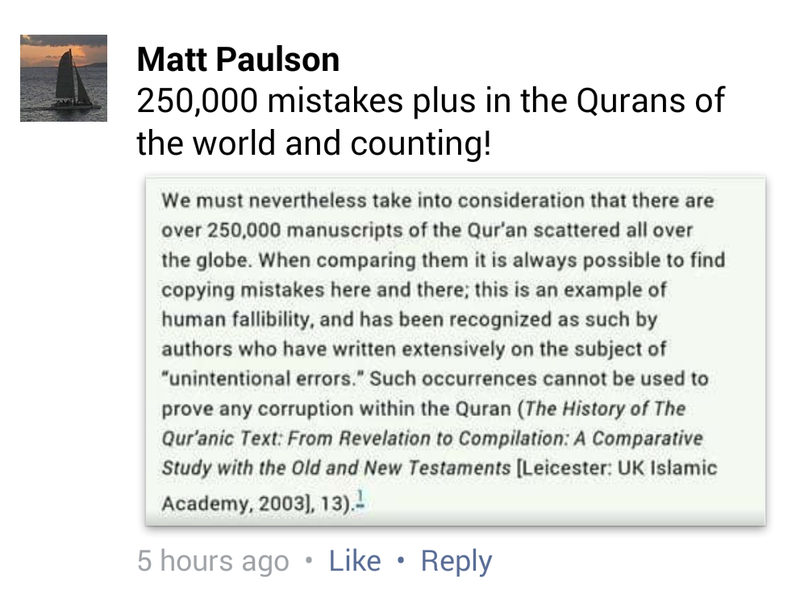 That there are 250 000 mistakes in the Qur’ans worldwide. To me, this is pretty funny as I don’t have to do anything to “respond” to him. He’s given the quote and posted his comment, both are in conflict and so he’s done my part for me, by refuting himself. That’s what I enjoy about the Missionary Mishap series. Almost every post in this series demonstrates the lengths to which missionaries will go, even to the point of quoting something and not being able to read it properly. It makes for good entertainment.